What are values for choice field types? Explaining the function of values in Fulcrum. 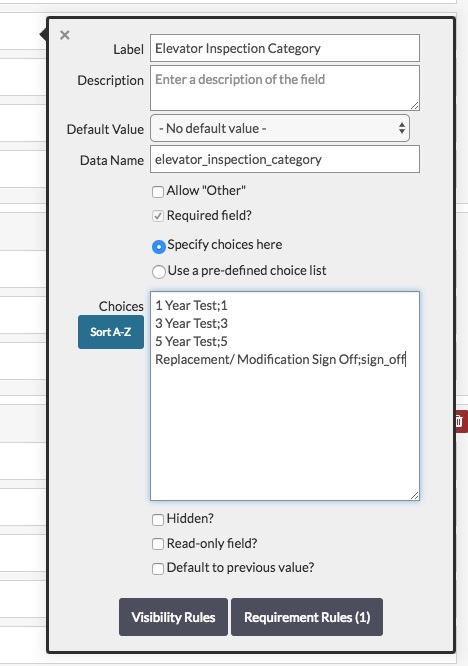 Values are similar to data names for your fields but instead are used for choice options in a choice field types (Single Choice, Multiple Choice, Yes/No, and Classification Set fields). The "label" of the selected choice is what is displayed within Fulcrum, but when you go to export the data out of Fulcrum the "value" is what is included in the exported data. Additionally, the "value" is what is pulled into calculation fields or data events. This allows you to populate the choice option label with human-friendly text while still storing the value that your system uses to represent a choice option. With predefined choice lists or classification sets the label column is on the left and the value column is on the right. When choice options that are defined inline with the choice field you can define the values by using a semicolon ; as the separator between the label and value. 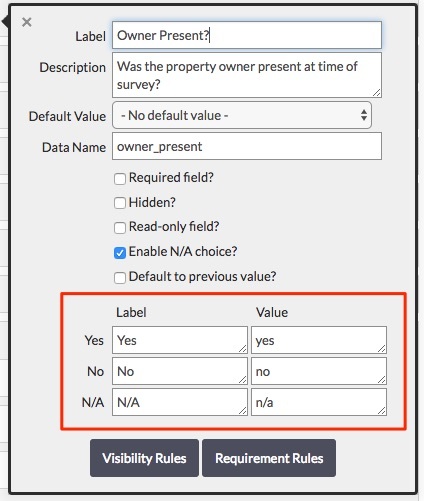 For Yes/No fields the label and values are populated directly within the field options popup. Values must be unique for each choice option. If the values are not unique then you can run into a situation where the system does not know which label to display for the value that is stored in a field.